NASA researchers are teaming up in the new collaborative program called The Frontier Fields to look deeper into the universe than ever before, working together to unravel the mysteries of the Universe. NASA’s Hubble, Spitzer and Chandra space telescopes are teaming up to look deeper into the universe than ever before. With a boost from natural “zoom lenses” found in space, they should be able to uncover galaxies that are as much as 100 times fainter than what these three great observatories typically can see. In an ambitious collaborative program called The Frontier Fields, astronomers will make observations over the next three years of six massive galaxy clusters, exploiting a natural phenomenon known as gravitational lensing, to learn not only what is inside the clusters but also what is beyond them. The clusters are among the most massive assemblages of matter known, and their gravitational fields can be used to brighten and magnify more distant galaxies so they can be observed. The first object they will view is Abell 2744, commonly known as Pandora’s Cluster. The giant galaxy cluster appears to be the result of a simultaneous pile-up of at least four separate, smaller galaxy clusters that took place over a span of 350 million years. Astronomers anticipate these observations will reveal populations of galaxies that existed when the universe was only a few hundred million years old, but have not been seen before. “The idea is to use nature’s natural telescopes in combination with the great observatories to look much deeper than before and find the most distant and faint galaxies we can possibly see,” said Jennifer Lotz, a principal investigator with the Space Telescope Science Institute (STScI) in Baltimore, Md. Data from the Hubble and Spitzer space telescopes will be combined to measure the galaxies’ distances and masses more accurately than either observatory could measure alone, demonstrating their synergy for such studies. The Chandra X-ray Observatory also will peer deep into the star fields. It will image the clusters at X-ray wavelengths to help determine their mass and measure their gravitational lensing power, and identify background galaxies hosting supermassive black holes. 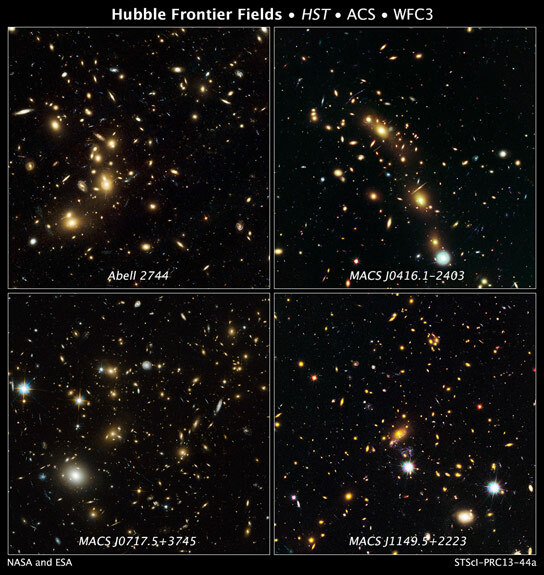 High-resolution Hubble data from the Frontier Fields program will be used to trace the distribution of dark matter within the six massive foreground clusters. Accounting for the bulk of the universe’s mass, dark matter is the underlying invisible scaffolding attached to galaxies. Hubble and Spitzer have studied other deep fields with great success. The Frontier Fields researchers anticipate a challenge because the distortion and magnification caused by the gravitational lensing phenomenon will make it difficult for them to understand the true properties of the background galaxies. Be the first to comment on "NASA to Look Deeper Into the Universe than Ever Before"